On Friday 9th September employees and guests of MWA attended the inaugural Candlelighers Awards ceremony held at Elland Road in Leeds. As sponsors of the award for “Team Effort of the Year”, Kieron Wright presented the award to the worthy winners, Team Olivia Weston. Together they have raised over £ 25,000. 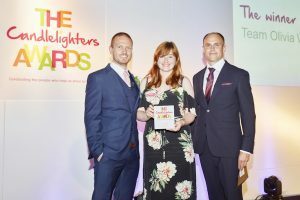 All the nominees for the different awards have raised money in order to try and make a difference in the fight against children’s cancer in Yorkshire which is what Candlelighters have been doing for over 40 years. Candlelighters is a charity which continues to grow and develop all the time. A new Candlelighters bus was launched at the event which takes some of the much needed services provided near the hospital closer to home for those who find it more difficult to travel. Counselling services, massage and a quite space is provided on the bus staffed by experienced volunteers. Awards were given for a range of categories including Weird and Wonderful Idea of the Year, Young Fundraiser of the Year and Volunteer of the year. As parents ourselves we were particularly touched by the efforts made by siblings of those who have suffered as well as those who have been sufferers themselves. In supporting the families of children with Cancer, MWA are proud to help Candlelighers anyway they can and as well as donating a small proportion of their fees each month to the charity, employees and their families are involved in various fundraising activities throughout the year. Keep an eye out for Kieron’s 24 hour Cross Fit challenge and Sophie and Lisa’s Fire walk – both scheduled for later this year. Their own children are also getting involved with a Lego Walk organised by the charity. Please see the website, www.candlelighers.org.uk for further information.